Over the weekend, I read Nancy Bo Flood’s new book, Water Runs Through This Book (Fulcrum Publishing, 2015). What a cool genre mash-up about one of my favorite topics–water! This book is packed full of facts, photos, ponderings, poetry, quotations, questions, and wonder. It’s perfect for upper elementary and middle school students, but you could also share a lot of excerpts from it with your primary students. 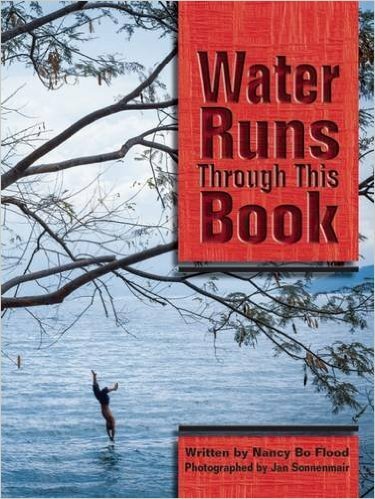 Want to add this lovely book to your study of water? Nancy has kindly sent me two copies to give away! Just enter here to win one of the two copies. Visit this post on my own blog to enter the contest through Rafflecopter. The contest goes all week–if you don’t win, you can find the book at an indie bookseller on Indiebound or through Amazon. 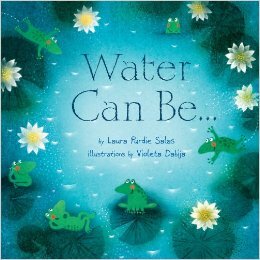 This Friday, I’ll share a poem from the book, too, and don’t miss Nancy’s recent online roundup of picture books about water–all of which would make lovely pairings or bookalikes for Water Runs Through This Book. In this blog feature, I share a picture book I really enjoy and externalize my process of reading it. I’m hoping this will be useful for those of you who are educators sharing books with kids and perhaps give you ideas of some elements you could include in your book discussions. Today I am reading a book called Under the Freedom Tree. Before I read it, I flip through it to get some ideas about it. On the cover, I see that author is Susan VanHecke. I know she’s the author because the other name has “Illustrated by” in front of it. I know her a little bit, so I’m really hoping I like the book. From the title and the picture on the cover, I’m wondering if this book is about slavery. When I flip through the pages, the pictures show soldiers and also a lot of black people doing hard work. The words are arranged on the pages like a poem, and I also wonder if it’s going to be a rhyming book. I see the book has several different parts, and each section starts with a big number that is a year: 1861, 1862, etc. So I know the events of this book happened a long time ago. It looks like there’s more information at the back of the book in an Author’s Note. A lot of times, author’s notes are used in nonfiction books, so I think the events in this book might be true. Now I feel ready to read. More tomorrow…. Digital Review Copies of Water Can Be… Available! Email me this month and let me know you’re interested (click here to see my email address). Log in (or create an account) at NetGalley and download the e-book. You’ll be pre-approved. Rate and/or review on some platform if you’re willing: Amazon, Goodreads, your blog, Facebook, Twitter, or your private teacher or librarian email lists or groups, etc. Even a one-sentence review helps! In-depth reviews are lovely, but not everybody has time for that, which I completely understand. If you can cross-post your review, great! If you just mention it on Twitter, great! I will appreciate whatever you can do in your jam-packed day. And, of course, I want you to be honest! Share what you like and don’t like. And that’s it! Hope to hear from you! I had a fantastic time at NCTE in Boston recently, and one of my favorite events was the Orbis Pictus session, where the current Orbis Pictus committee shared the winner of the 2013 NCTE Orbis Pictus Award for Outstanding Nonfiction for Children, as well as the honor books and recommended books. It was great fun seeing educators share with passion, humor, and admiration what they love about these various books. Like many folks, I have a gut reaction aversion to mimes, but after hearing the book talk for the winning book, Monsieur Marceau: Actor Without Words, by Leda Schubert (Roaring Brook Press), I’m ready to read this. Actually, forget hearing. Just seeing Chair Fran Wilson mime opening up a book and being shocked at its fabulousness was enough to hook me. And who knew Marcel Marceau was a hero during WWII? I’ll soon be reading this title and just about every other book on the list that I haven’t already read. So, if you’re wondering if you’ve missed any spectacular nonfiction books this past year, check out the complete Orbis Pictus list. This post was cross-posted at my blog, laura purdie salas: writing the world for kids.